Nail art sticker is derived from the technique of transfer decal. You can apply the designed art sticker at one time, no need to attach one by one. Anyone can use easily and apply the sticker well balanced. Beautiful finish by using traditional Japanese lacquer art technique Various expressions with different powder materials. Provide the expression like rhinestone coating the transparent ink over holographic foil. Select the sticker and cut off, then peel off the release paper. Please be careful the sticker might be broken if you bend it too much. Please wipe off dust or oils of fingers on the nails. Apply the sticker where it should locate. ※Please be careful the sticker cannot be re-applied. Please press and rub strongly with fingers over the pattern. Peel off the top clear film and wind it up from base of nail slowly and smoothly. Please press stably with fingers or cloth. 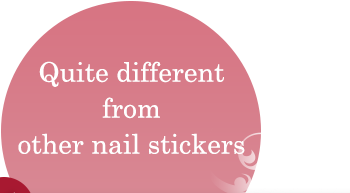 ※Please apply the sticker on the nail after nail color or base coat is completely dried. ※We recommend to use the top coating after applying the sticker. ※When you remove the patterns, please use the nail polish remover. Soaking the remover into cotton and make the patterns soft and remove it by fingers. Copyright©2016 TOYO LABEL. All Rights Reserved.